Written by Louise Cowan, Trainee Liaison Librarian. 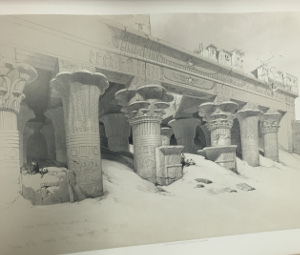 An Oxford-based photographer, Taunt won great acclaim for the high quality and technical skill displayed in his work, and his photographs, sketches and maps helped to transform, ‘the popularity of the Thames during the Victorian era.’ (In the Boat Shed). 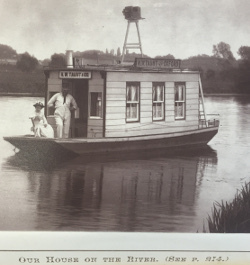 Sometime resident on the river, Taunt could often be spotted ‘in his nautical garb and yachting cap’ (Oxfordshire Blue Plaques) and was known to expertly capture the people and places along the river, providing, ‘an excellent record of late nineteenth and early twentieth century architecture, and town and rural life.’ (National Archives). Each place of note along the river is given a carefully sketched map alongside photographs of sites you may see along the way. 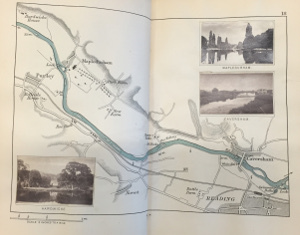 This sketch of Reading for example, includes photographs of Caversham, Hardwicke House and Mapledurham. Map of the Thames at Reading. The advertising pages included at the front and back of the book are equally interesting. For example, you could visit ‘Lovejoy’s Library’ apparently the, ‘Largest Provincial Library in the Kingdom’ run by a Miss Langley on London Street in Reading or you could hire a boat from Arthur Henry East at the Kennet’s Mouth if you fancied trying out some of the routes sketched in the guide. 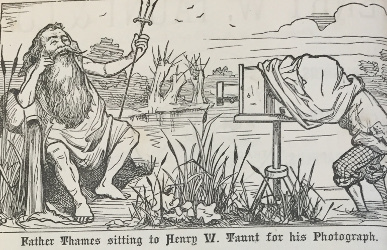 Meanwhile, the adverts at the front of the book boast the talents of Taunt himself, one giving a delightful sketch of his shop on Broad Street, Oxford while another features a fun cartoon of Taunt photographing an anthropomorphised ‘Father Thames’. 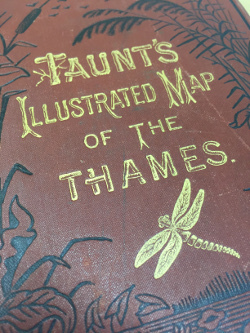 As a result of his fantastic survey and mapping of the River Thames, Taunt was elected as a Fellow of the Royal Geographical Society, (Oxfordshire Blue Plaques) and he is credited with sparking, ‘a national love affair with the river that remains to this day,’ (In the Boat Shed). 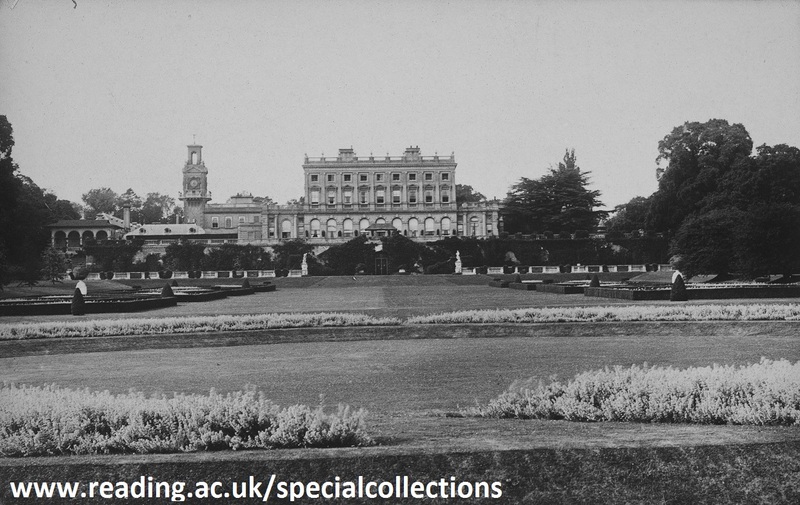 Jack Davies, Assistant Lecturer of History and PhD student at the University of Kent, tells us about his research into stately home hospitals during the First World War, notably at Cliveden, Buckinghamshire – the home of the Astor family. My research examines the social and cultural importance of the stately home hospital during the First World War. These personal residences were used to supplement the inadequate military medical infrastructure to provide care for wounded soldiers from all over the British Empire. 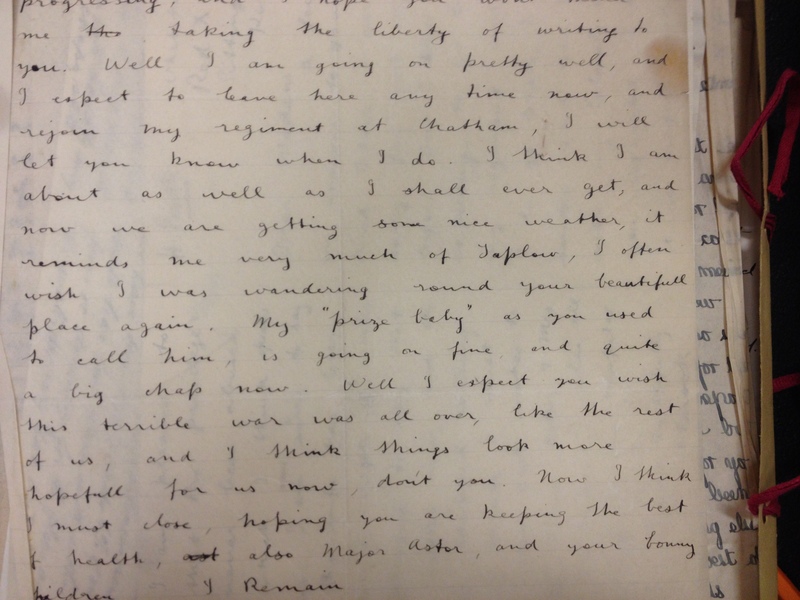 The University of Reading’s Special Collections have been remarkably useful due to its Nancy Astor archive (MS 1416). 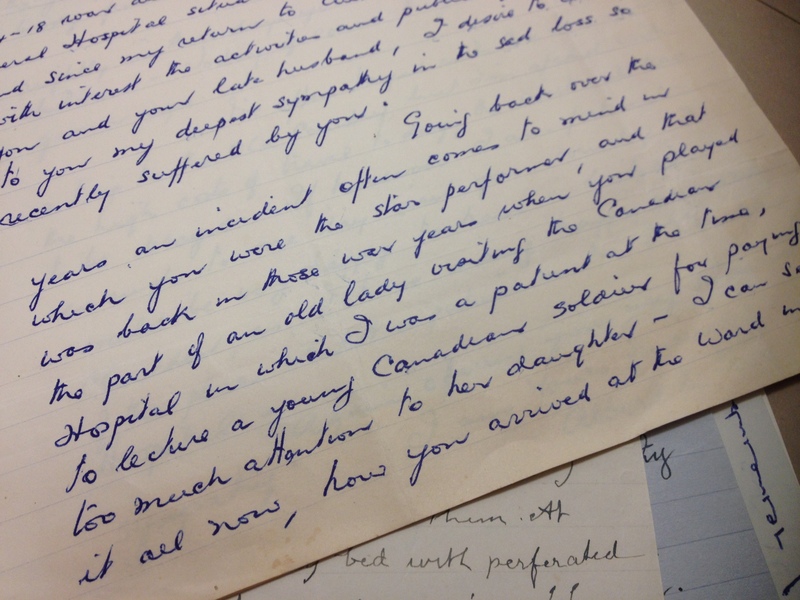 The library contains a wide range of correspondence from Nancy herself, who is most famous for being the first female MP to take a seat in the House of Commons in Great Britain. A lesser-known fact about Nancy Astor, however, was that her and her husband Waldorf converted their home into a hospital during the First World War. After having their initial offer rejected by the War Office, the Astors turned instead to the Canadian government. Though they rejected the use of the home, they agreed to build a hospital on the covered tennis courts; eventually a 600 bed military hospital was created within the house itself. ‘when you [Nancy Astor] played the part of an old lady visiting the Canadian Hospital in which I was a patient at the time, to lecture a young Canadian soldier for paying too much attention to her daughter’. 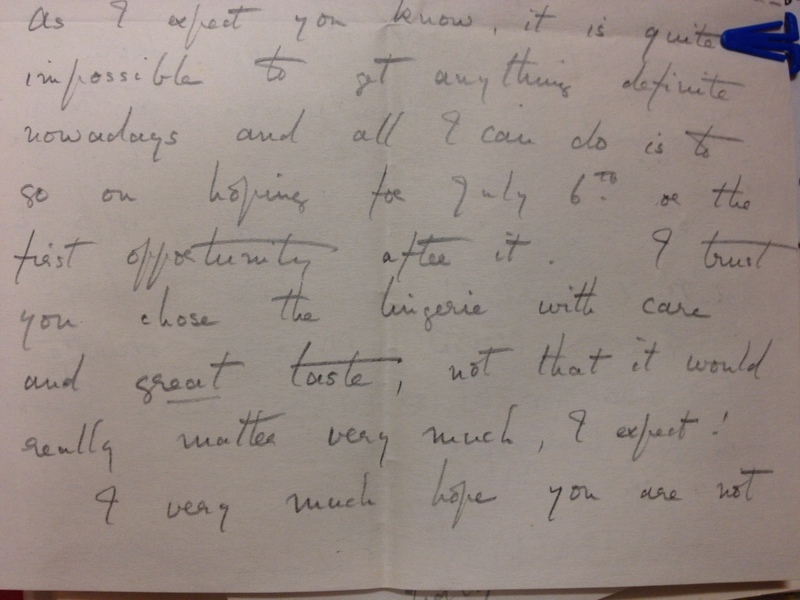 Unfortunately the collection does not contain Nancy’s responses to these peculiar letters, and while we may be unable to discover the truth surrounding their relationship, the discovery of this correspondence certainly piqued my attention, as well as the archivists’ after a long day of research. 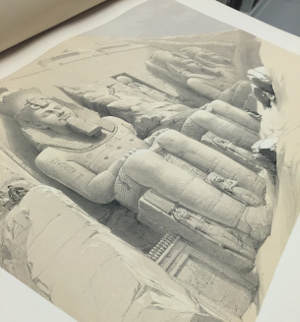 Jack Davies is an Assistant Lecturer of History and PhD student at the University of Kent. You can find out more about the Nancy Astor Archive here, and information about accessing our collections here. This short guide for bee keepers provides helpful tips on everything a budding bee-keep needs to know; from how to use the newest glass hive, how to purchase bees (the best time of year is February if you’re interested! ), the type of flowers bees like best (Rosemary and Lemon Thyme) and of course, how to obtain your honey! to the science of the bee. 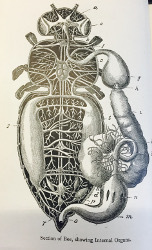 The work features several small but detailed diagrams alongside interesting facts and anatomical descriptions. 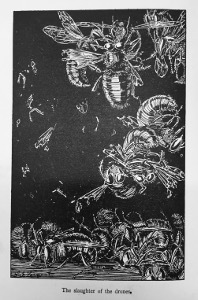 Interestingly, I learned that bees have different types of sting; the queen generally uses hers only against a rival and is able to extract her sting much more easily than a worker bee by using a spiral motion much like drawing a corkscrew out of a cork. Worker bees are more likely to lose the lower part of their abdomen when withdrawing their sting while drones are not provided with a sting at all. 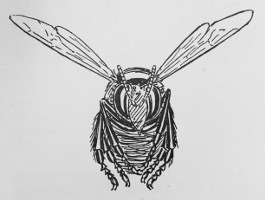 Cowan also describes how one apiarist, Stahala, had ascribed meanings to the various sounds bees make; a loud ‘Huummm’ for when the bees have a queen and their food stores are good but a ‘Dzi-Dzi’ when food stores are low or a loud ‘Dziiii’ when they’re too cold! Dedicated to the very same T.W. 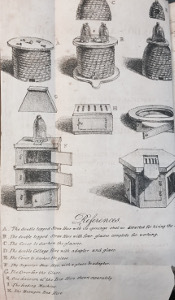 Cowan (above) Edwardes’ book of lore is a full history of bees and bee keeping. 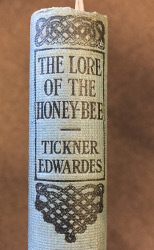 It explores bees from the Greek myth of the nymph ‘Melissa’ (meaning ‘honey bee’) who fed the baby Zeus with milk and honey; praises the fourth book of Virgil’s ‘Georgics’ where the author’s ‘love for his bees shines through,’ and comments on a small book published in 1656 ‘The Country Housewife’s Garden’ which focuses on rule of thumb methods of beekeeping for fellow cottagers. 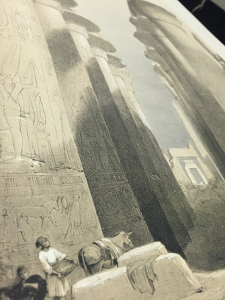 Alongside this history, Edwardes goes on to describe the features of the hive and weaves the story of the life of a bee in a romanticised light, for example, comparing the architectural supremacy of the honeycomb to the dome of St Paul’s and the great pyramids. in 1957. In it Elkon provides a lovely introduction to honey, which features some key bee basics. For example, did you know that flower nectar has individual flavours and, “drones and workers who can’t produce their quota of honey are thrown out to die of exposure.” It’s not easy being a Bee! 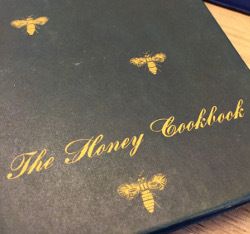 Elkon’s cookbook is full of delicious sounding recipes ranging from honey bran bread, to honey glazed hams and sugarless chocolate honey cakes. As Elkon points out, honey is much healthier than sugar too…so you won’t feel too guilty for indulging in some of those treats! ‘Adventures in Hiveland’ by Frank Stevens is an interesting little story following the adventures of Jackie and Vi, two young children who meet the enigmatic elf-man ‘Nameless’ who shrinks them in size until they are small enough to explore inside a Beehive and learn about the lives of the bees who live there. Although the story has quite a sad ending and sees more untimely deaths than a ‘Game of Thrones’ it gives a fascinating insight to the life of a bee, from Queen to Drone and is full of lovely sketches of the insects! 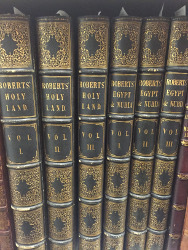 These volumes from our Bee Collection are available upon request.